Now this time too difficult to Bypass FRP from Samsung Galaxy devices because of new security patch by Samsung, That’s why we need more hard work to Bypass FRP Samsung Tab A 10.5, finally we found a process to Bypass Google FRP Samsung Tab A 10.5 easily, Now here we share that method, follow this if you also facing the FRP lock on your device, only you need a working PC and Downloading Some FRP files and FRP tools thats, this will help you to Bypass FRP and Access your device home screen once again. so follow the right way to Bypass FRP Samsung Tab A 10.5 easily. Make Sure: We tried this Method on Samsung Galaxy Tab A SM-595N FRP Bypass, also you this method helps you to Bypass FRP from SM-T595D FRP Bypass. Samsung has updated their security level, Samsung fixed all the security bypass process that help us to Bypass FRP, so we working on new method find the best solution to Bypass Google FRP Samsung Tab A 10.5 -Android 8.1 easily. -After that, Press and hold the (Volume Up and Power) key together, until you see Android logo appear on your device screen. -After that, press (Volume UP and Power) key same times once to Bypass SM-T595N FRP Bypass. -Then there you will see your device firmware version (T595XXU1ARG5). -Now download the same bootloader version Firmware and stock Firmware from below to Bypass FRP Samsung Tab A 10.5. -We want to Download latest stock firmware so that’s why we want to share a website “Sammobile.com”, because we need the latest version of Stock firmware to Bypass FRP Samsung Tab A 10.5-Android-8.1. -Once done, Then go to”Firmware” tab and put your device model name and then download latest stock firmware according to your device country and model and Bootloader version. -After that, Now follow the main process to complete Bypass Google FRP Samsung Tab A 10.5 easily. -Now on the “Recovery Mode” select “Reboot System” by using Volume UP and Down key and then confirm to press Power key. -First, download Tab A 10.5 Combination file on your PC, and also download the latest “Odin” tool. -Then extract the Tab A 10.5 Combination file. 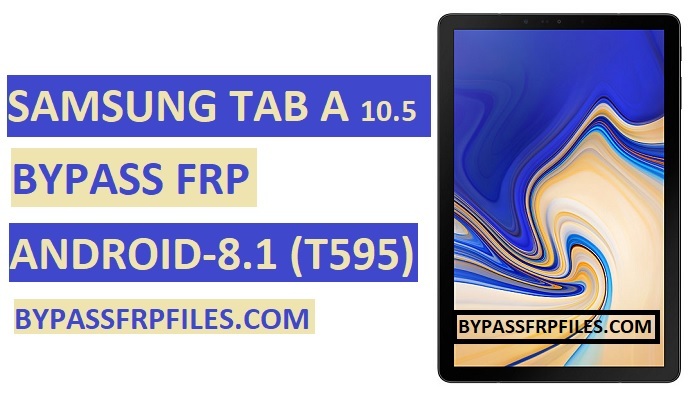 -Once all the files extracted, then follow this process to Flash the combination firmware and Bypass Google FRP Samsung Tab A 10.5 (SM-T595N FRP Bypass). -Once Odin tool is opened. -Now hit the “START” button on the Odin tool to Bypass Google FRP Samsung Tab A 10.5 -Android-8.1. -Once flashing successfully finished. then your device automatically boot in to factory menu. -Then you will redirect to the “Settings” menu to SM-T595N FRP Bypass. -Then go down and then enable “OEM Unlcok” and “USB Debugging” mode there. -then press any to Bypass Google FRP Samsung Tab A 10.5. -Done, Now we need to flash the Stock firmware to successfully Bypass FRP Samsung Tab A 10.5. -Then choose the Stock firmware file to successfully Bypass FRP Samsung Tab A 10.5. -Power off your device then press and Hold (Home+Volume Down+Power) key, until your device boot in to the “Warning” screen. -Then flashing will be started. Thanks for visiting us, Comment below if you face any problem With Bypass FRP Samsung Tab A 10.5-Android 8.1, we will try to solve your problem as soon as possible. Do you have the combo for for the sm-t590?